Hampton Jitney is one of the world's richest and most powerful men. He walks in the corridors of power and has Presidents and Kings on his payroll. 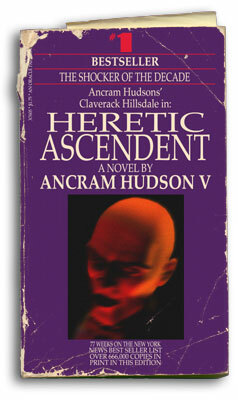 In Heretic Ascendent, Hudson finally reveals how Jitney maintains that fortune. From his control of Wall Street to the poppy fields of southeast Asia, Jitney's web of evil is explored as he defends his empire against a threat from a younger, seemingly more powerful warlock. This novel in exceptionary in the century long history of the franchise because Hillsdale appears in only the last chapter, and acts as an unwitting pawn in Jitney's deadly game. This was one of the best selling Claverack Hillsdale novels and was optioned to become a film, which never happened due to an endless Hollywood production shuffle. Speculation says that no director wanted to take a chance on encountering the Hillsdale Jinx.